"The only job I am thinking of is the role of the prime minister, and if not me, then Ahmed," says MK Tibi. 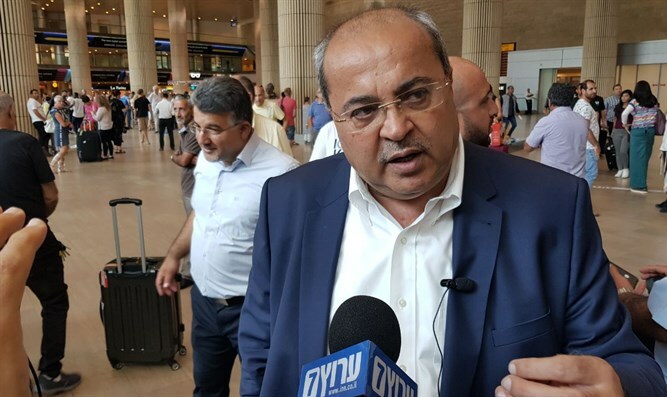 "The only job I am thinking of in the future, because of the bi-national reality that the right is leading to, is the role of the prime minister," MK Ahmed Tibi (Ta’al) said in an interview with the Yediot Aharonot newspaper. "I am very serious. And if I it’s not me, then it will be another Ahmed, Mohammed or Mahmoud," he stressed. “Even if I oppose such decisions in the government, I still bear collective responsibility. Forming a bloc against them is another matter." Asked whether the Arabs will go to the polls and vote in the coming elections, he said, "I do not think that if we tell the Arab public to go to the polls, it’ll be enough. We have to rehabilitate and correct mistakes, we have to talk to the Arab voter's mind and present him with proof of action. Ta'al, headed by me, will show our work and we will convince the voters to vote for us." Tibi was also asked if there is room for a Jewish representative in his party and replied, "I do not rule this out. A progressive, democratic Jew who recognizes the rights of equality and an end to the occupation can be part of Ta'al. It requires a discussion and there are Jews who identify with our goals. In recent weeks I have been contacted by many Jews who want to vote for us." Tibi recently split from the Joint List in order to run separately with his Ta’al party. He has in the past encouraged Arabs to disobey the “Muezzin Law” which would limit the use of loudspeakers during the call to prayer in mosques. He made similar comments about being Israel’s Prime Minister in 2017, after US President Donald Trump hinted that he was not necessarily committed to a two-state solution and that he would be happy with any agreement Israel and the Palestinian Authority reach. At the time, Tibi told CNN that, should a “one-state solution” be decided upon, he intends to run for Prime Minister against Netanyahu. Tibi said that he had no doubt that he would win against Netanyahu, since all Palestinians would vote for him - as would some Israelis. The significance of such a vote, he said, would be that he would be victorious over Netanyahu and would become the Prime Minister.